A new Big Green Machine is on the block courtesy of Eaglemoss but this isn’t one with which you’ll be overly familiar. 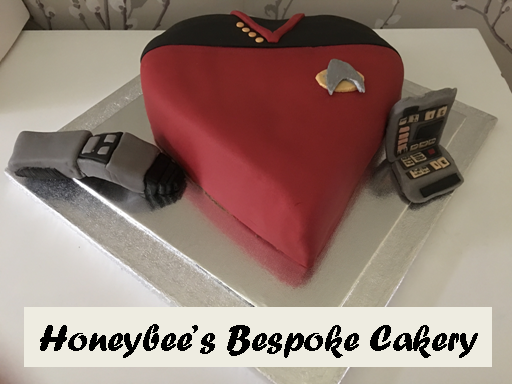 It’s only made (so far) one, solitary appearance in the Star Trek universe and even then it was barely glimpsed on screen on a screen. 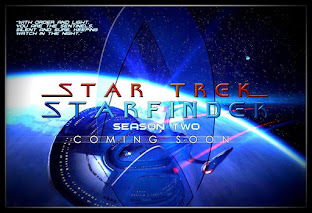 The 2009 reboot movie features a Kobayashi Maru sequence and within that infamous scenario we have the opposing Klingons using the Kelvin Timeline equivalent to the D7 Battlecruiser. To be fair it probably appears on screen longer than any of the ships from the equally infamous Wolf 359 graveyard and it’s absolutely in keeping with the Prime Klingon design ethos that wasn’t necessarily followed when it came to the Bird of Prey from the subsequent Into Darkness. 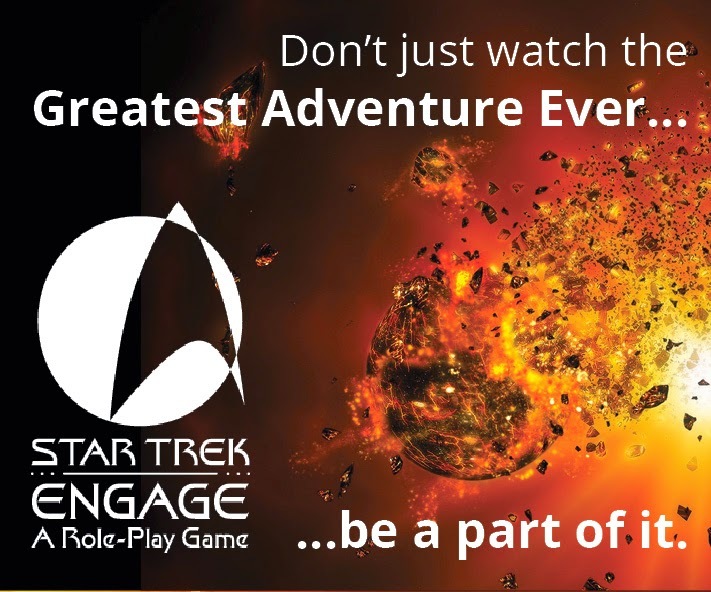 Coming in at xxcm long, the Klingon Battlecruiser is one heavy muthafucker. 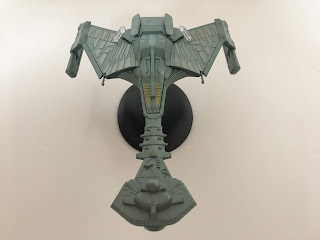 Painted up in two-tone green, the design heritage - or homage perhaps more accurately - is there for all to see with the basic command section, connecting neck and body plus nacelles formation firmly in place. Let's - unusually - start from the back. The twin warp nacelles sit at their slightly jaunty angle and carry a nice bit of tech detail on their surface. 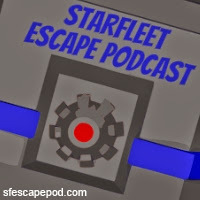 There’s the usual assortment of lumps and bumps indicating that more function-over-form approach you might expect from the Klingons but what is missing are the translucent inserts for the warp field grilles. On something of this scale I would have expected this almost as a standard instead of painting in the paired grille slats. These two chunky engines then lead back into the short green pylons and then onto the main engineering hull section. The origin of the form is clearly planted in the D7 Class from The Original Series and get there are a ton of nuances and tweaks that make it distinctly Kelvin. Take the hull plating for example. At first glance it’s very similar to the K’T’inga upgrade but the pattern of the bird feathers feels more aggressive thanks to the addition of a couple of fins here and there and extra firepower. Mind those two additional leading edge guns though because they are fairly bendy and thin - certainly bits to be cautious with. 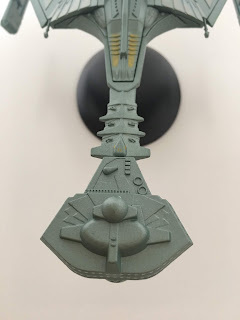 At the rear edge there are two yellow protruding impulse engines that seem oddly stuck on and out of place, flanking a rather basically detailed docking port - definitely the area of the cruiser that's been neglected in the design process. 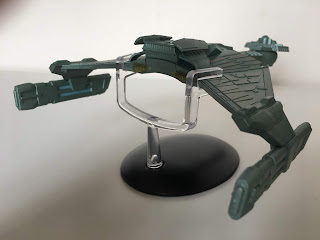 For note, only this hull upper and the warp engines are in plastic with the majority of the ship produced in metal and on the bottom this really works well as we will see shortly. Just adding on top of a great design has added to the visual spectacle of the Battlecruiser and Eaglemoss have managed to produce a piece of kit that shows off all its assets far better than they were in 2009 in the blink of an eye. 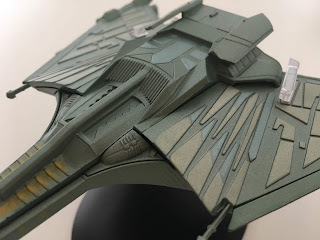 Look closely and you’ll see the echoes of the triangular pattern from the K’T’inga towards the centre of the hull while out towards the nacelles there is a more unique interpretation more mechanical in form than bird. Placing the ship alongside its two regular Collection cousins emphasises both these similarities and differences which Eaglemoss have captured so well. Down the centre line of the Battlecruiser there’s a lot more chunky Klingon hardware to pour over with the main engine compartment to the back and more armour plating stacked up down the more vulnerable neck section resembling vertebrae - literally a neck! 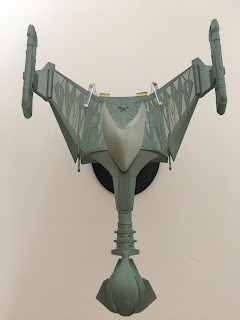 Now interestingly on that section, the finish mirrors the effect that was designed for the Klingon armour which was cut from the Rura Penthe scene in the 2009 movie It even goes a step further with the plating around the main command section imitating the shape of the Klingon helmets from the same film with the side pieces arcing around the torpedo launcher opening. What you can see getting towards the front end is that the mix of colours comes to a very abrupt end with everything from the vertebrae forward in the singular green. This is the case on the underside too where the forward sections are in one colour and the more ornate designs are left to the sole benefit of the body piece. In fact the finish on the underside is a little more tightly packed than the topside with the triangulated pattern emphasising the "bird" effect along the wing edges. 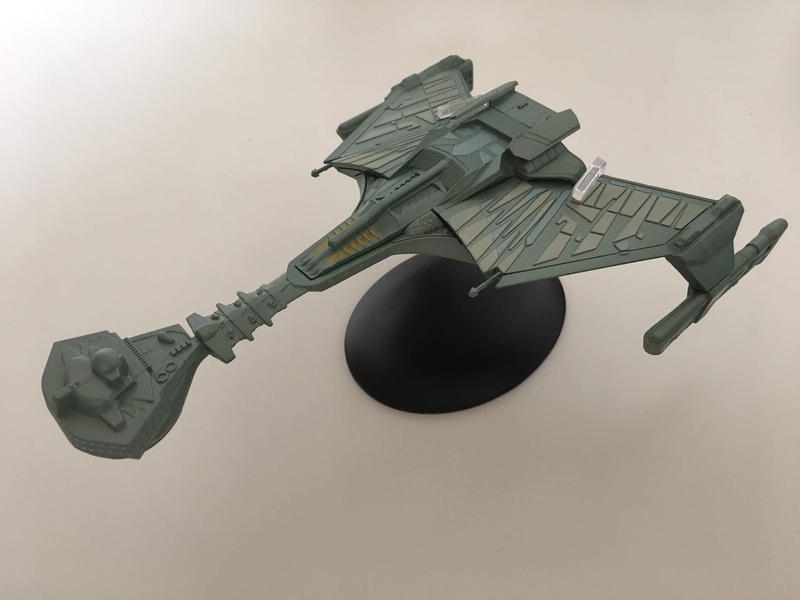 It's very striking and Eaglemoss have managed it without any hiccups right across the hull. The bridge section is lightly detailed but with that solo paint scheme remaining constant. The mixed finishing pieces to the top give it a more individual feel and avoid that mass-produced left/right mirror effect and adds more to that Klingon "personality" conveyed through their architecture. 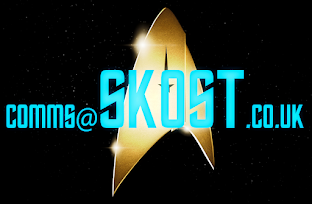 The similarities to the K'T'Inga are strong again with the central superstructure a clear descendant of the movie original. The stand grip clips around the rear central housing that sits proud of the engineering hull and then under the belly of the beast as per the other Klingon cruisers. Steady posture on this one and certain to look particularly menacing as part of any Klingon display. The magazine poorly disguises just how little background material there is on a ship purely created as a piece of the background with almost half the pages dominated by big sketches and CG renderings. There is very little to go on here aside from the point that the Battlecruiser was 90% a copy and paste job and 10% adding some fins and flicks to the established design before sticking it into the simulation. A lot of the concept for the finished product actually came from a scene in the 2009 reboot that never made it to the final cut. 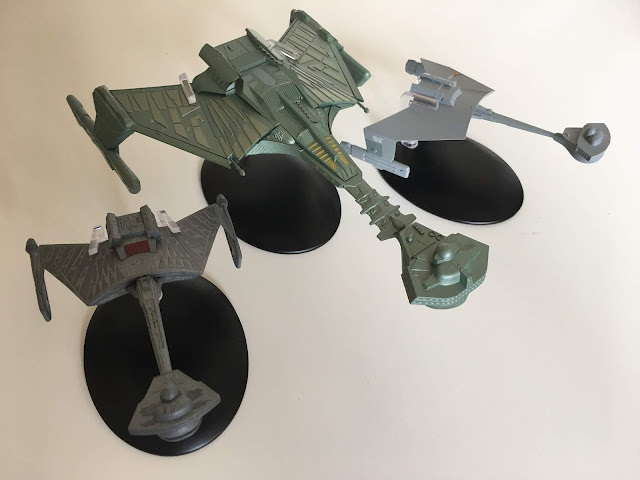 Closing out the printed piece of this edition we do get to enjoy the evolution of the Klingon cruiser through its various forms from The Original Series' D7, through to the Vor'Cha and the Negh'Var before spinning back in time to the D5's and such like from Enterprise. 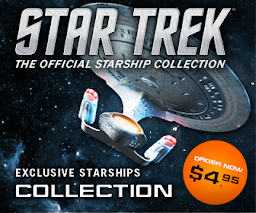 Lots of good old model shots from 90's Star Trek in there to drool over! Is this one to add to the fleet? Great special?